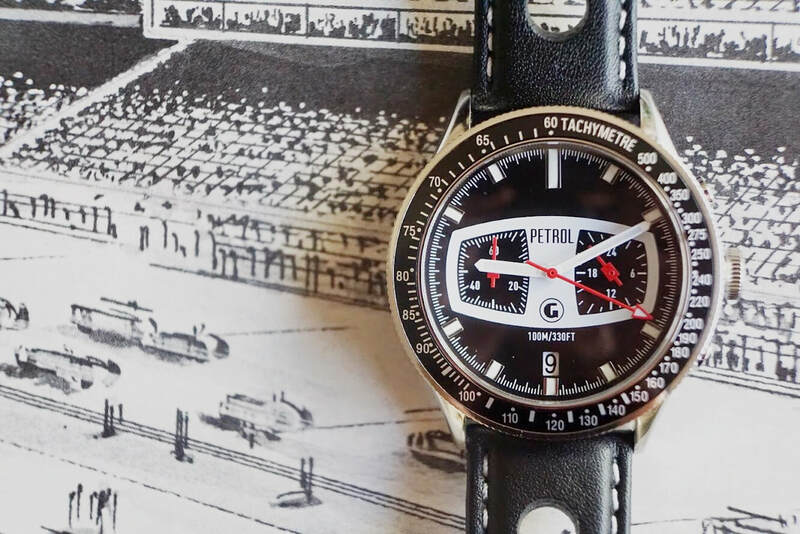 The PETROL has all the vintage style of a racing chronograph from the 1960s and 70s but with the performance of a brand new watch. 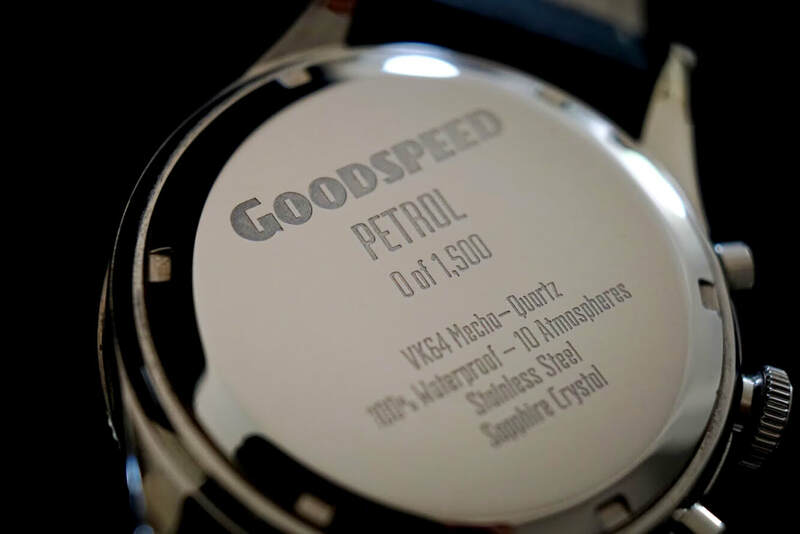 “Goodspeed” is a term you'd tell someone preparing to embark on a journey or an adventure. Maybe today’s journey involves a spirited drive through Topanga Canyon. Or maybe it’s just a day of conference calls. Either way, make sure your watch reflects your passions. The large red second hand with filled lume triangular end measures seconds lapsed when the chrono is started. The left subdial registers minutes lapsed. And the right subdial displays the 24hr time that corresponds to the current time of day. 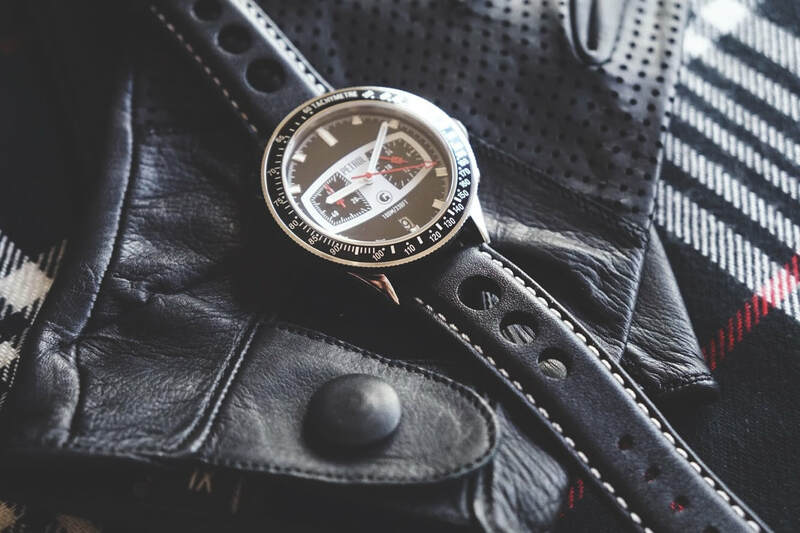 With those high contrast red hands on the white and black dial, it's easy to see what time it is or how fast the last lap took. Keep it simple. Along those lines, it won’t track your steps. Heck, it won’t even track a second time zone. 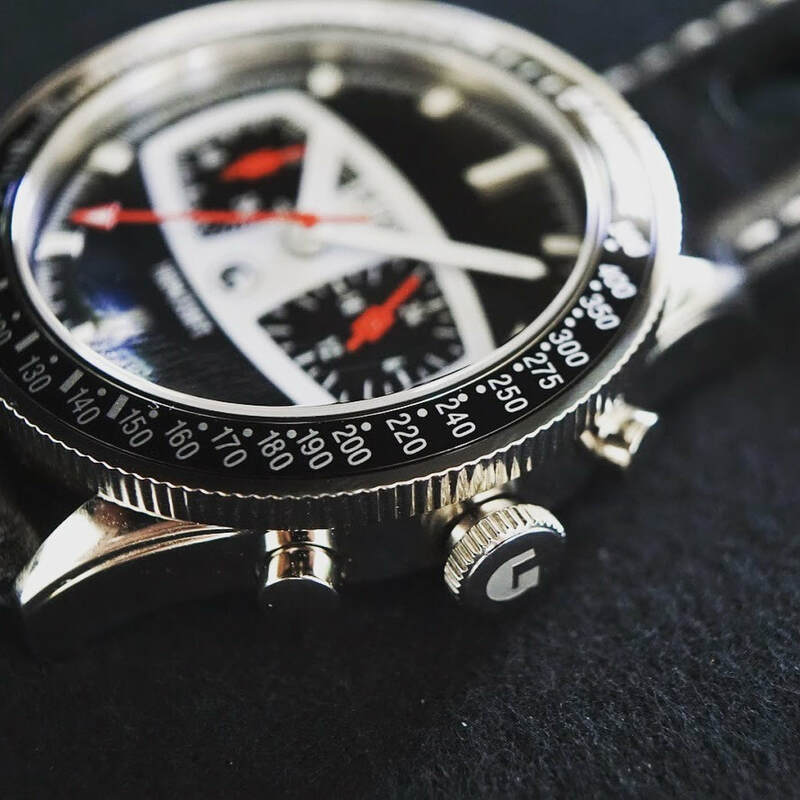 The PETROL is simply a well-made chronograph with a vintage inspired design and the internals to keep accurate time year after year. At 42 mm wide (without crown), we think this is the perfect size for the modern man. Not too big, not too small. The Seiko VK64 Mecha-Quartz movement is a workhorse that gives the reliability of a quartz movement but with the feel of a mechanical one. This is a high end Japanese quartz movement that has been used in watches that retail for over $600. A lot of time and energy went into designing and creating the PETROL. Taking design cues from a variety of vintage watches, many rough sketches were made until the final product began to emerge. A graphic designer was hired to turn the hand drawn sketches into production quality images. 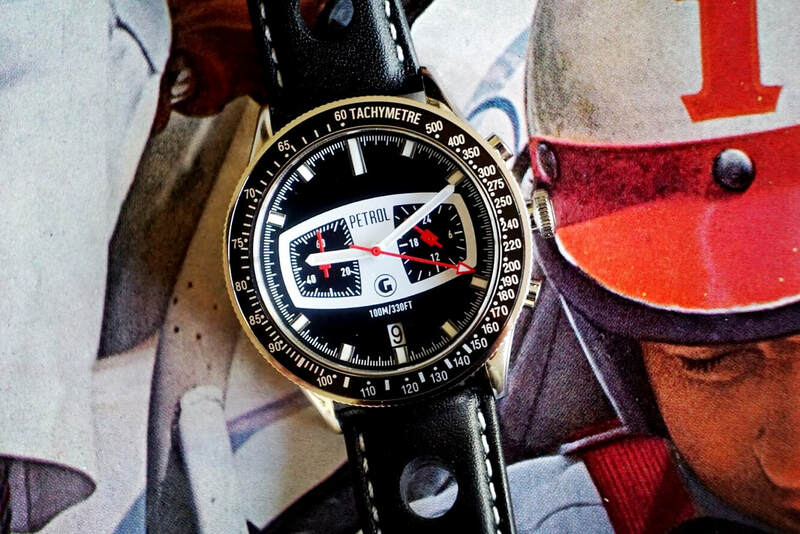 Many more revisions were made until the design of the watch you see here was finalized. Next, watch manufacturers were interviewed to find one that could take these design requirements and build a high quality watch at an affordable price. 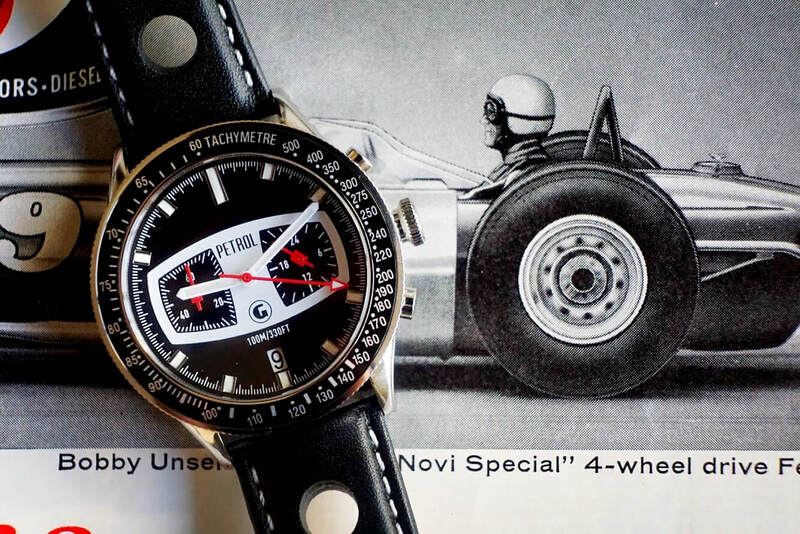 The manufacturer chosen has decades of experience building watches for some very reputable companies. 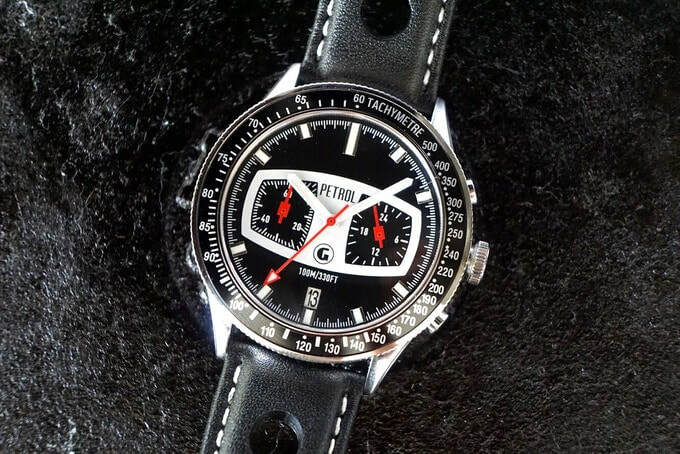 The prototypes they've made have blown away everyone that has strapped the PETROL to their wrist.